Send push notifications to iOS, Android, Safari and Web Push (Chrome, Firefox, Edge, Opera and others) devices straight from your WordPress site, in real-time. And you don't have to pay any fees since Push Notifications for WordPress does not use any third-party's server. Looking for Push Notifications for WordPress (Lite)? What's the difference? 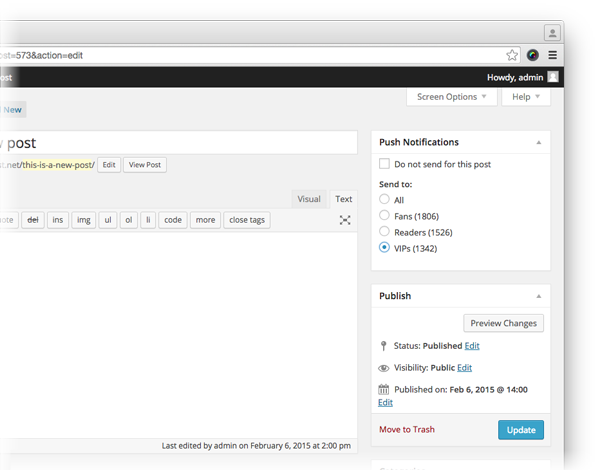 Push Notifications for WordPress has a built in hub, allowing WordPress to send out the push notifications directly. Content for the apps is collected automatically from your WordPress site, so no extra work is needed to maintain them. It even supports custom post types and Safari and Web Push (Chrome, Firefox, Edge, Opera and others) notifications. Packed full of features, perfectly integrated into your self-hosted WordPress website. 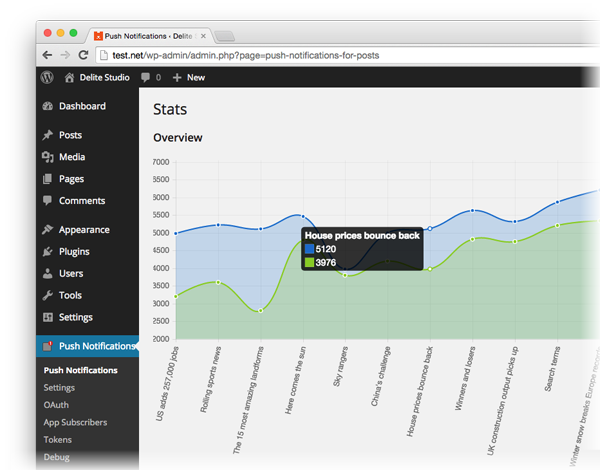 Get a detailed overview of all notifications. See exactly how many notifications you sent, how many of them were read, how many users converted into loyal readers, and so on. Find out exactly how your site is performing, what is working well and what isn't. Improve your engagement strategies. If you use only Safari and Web Push (Chrome, Firefox, Edge, Opera and others) notifications, you do not need to create the apps. When visiting a site that supports notifications, the user will receive a prompt asking you if he would like to turn them on. Web Push notifications also work on Android, even if the browser isn't currently active--just like an installed native app. That's a big deal! Send targeted, useful notifications only to some of them. Segmenting your subscribers based on their needs increases their loyalty to your brand and keeps them interested in your message. It's better to send out notifications to smaller targeted lists than large groups of subscribers. 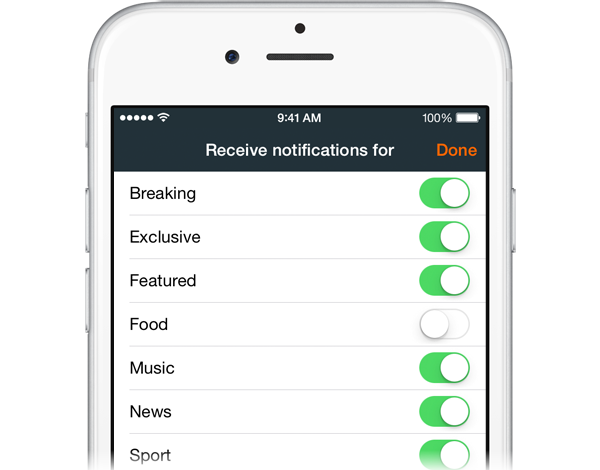 If you want, users can choose the categories of post of which receive push notifications. People are busy and do not like to have their time wasted. And when you do that you're likely to lose that subscriber. Choose the post types for which send push notifications. Push Notifications for WordPress is compatible with WPML and every theme or plugin that uses WordPress custom post types. 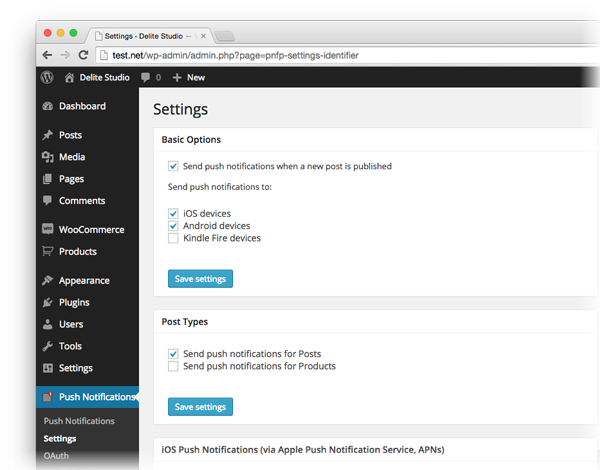 We think you'll forget that Push Notifications for WordPress wasn't part of WordPress. You don't have to pay any fees since Push Notifications for Posts does not use any third-party's server. 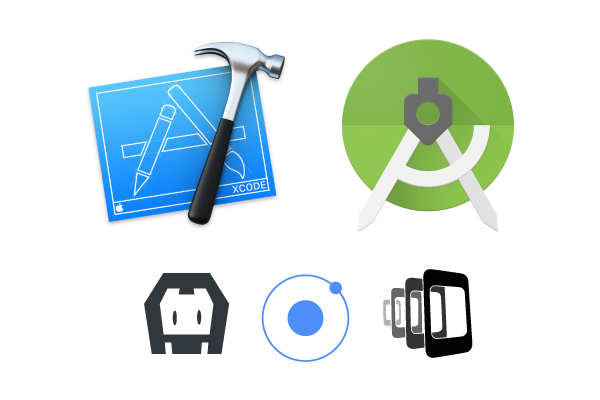 Build beautiful and interactive mobile apps using your preferred technology. Push Notifications for WordPress provides easy to use REST APIs, available via HTTP. Send and receive data using the simple JSON standard. 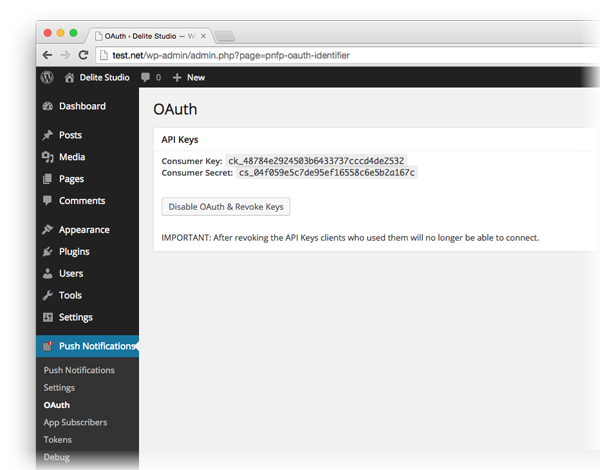 The APIs can be protected from abuse enabling OAuth. 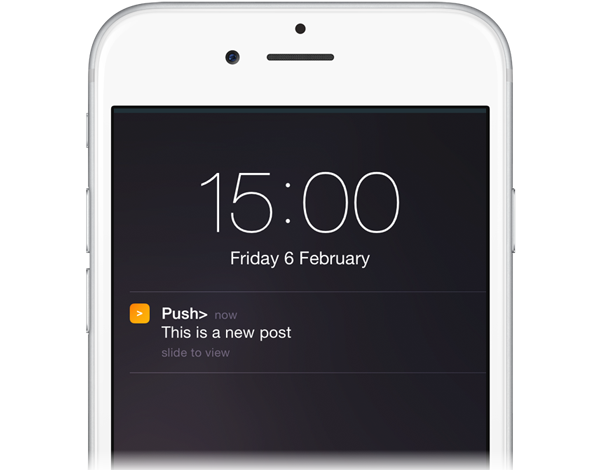 What you can do with Push Notifications for WordPress. In-depth documentation for each API call. After many weeks of seeking for a push notification plugin for my customers need, none of the one that I found did address all the requirements, and the most important one, was to not have any monthly subscription. 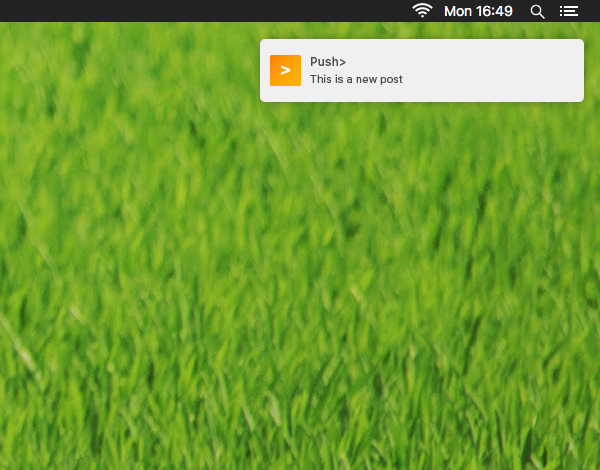 By accident I found Push Notifications for WordPress made by Delite Studio. Without any hesitation I bought the full version, it works just out of the box. Despite the fact that the iOS App is not yet available, I got a great support from the Delite Studio team, and in 24 hours my iOS app was working just fine. By digging more, i found other useful features that just make this plugin really a must to have.